Complement activation is involved in the pathogenesis of ischemia reperfusion injury (IRI), which is an inevitable process during kidney transplantation. Therefore, complement-targeted therapeutics hold great potential in protecting the allografts from IRI. We observed universal deposition of C3d and membrane attack complex in human renal allografts with delayed graft function or biopsy-proved rejection, which confirmed the involvement of complement in IRI. Using FB-, C3-, C4-, C5-, C5aR1-, C5aR2-, and C6-deficient mice, we found that all components, except C5aR2 deficiency, significantly alleviated renal IRI to varying degrees. These gene deficiencies reduced local (deposition of C3d and membrane attack complex) and systemic (serum levels of C3a and C5a) complement activation, attenuated pathological damage, suppressed apoptosis, and restored the levels of multiple local cytokines (e.g., reduced IL-1β, IL-9, and IL-12p40 and increased IL-4, IL-5, IL-10, and IL-13) in various gene-deficient mice, which resulted in the eventual recovery of renal function. In addition, we demonstrated that CRIg/FH, which is a targeted complement inhibitor for the classical and primarily alternative pathways, exerted a robust renoprotective effect that was comparable to gene deficiency using similar mechanisms. Further, we revealed that PI3K/AKT activation, predominantly in glomeruli that was remarkably inhibited by IRI, played an essential role in the CRIg/FH renoprotective effect. The specific PI3K antagonist duvelisib almost completely abrogated AKT phosphorylation, thus abolishing the renoprotective role of CRIg/FH. Our findings suggested that complement activation at multiple stages induced renal IRI, and CRIg/FH and/or PI3K/AKT agonists may hold the potential in ameliorating renal IRI. The incidence rates of acute kidney injury (AKI) are estimated to be 21.6% in adults and 33.7% in children, with mortality rates of 23.9 and 13.8%, respectively (1). Therefore, the management of AKI remains a global public health concern (2). Kidney replacement therapy decreases AKI-associated mortality, but the limitations of effective peritreatments persist at an unacceptably high rate (3). Ischemia reperfusion injury (IRI) is an unavoidable but improvable condition that primarily affects graft function and survival in renal transplantation (4, 5). IRI can exacerbate the state of oxidation and initiate immune responses to allograft, thus leading to the delayed graft function (DGF) and allograft rejection (5–7). DGF, as a primary consequence of IRI, results in an early allograft dysfunction that requires dialysis treatment and further increases the incidence of rejection with a poor long-term allograft survival (8–10). Treatment with simvastatin or thymoglobulin ameliorates IRI by preserving the microvascular barrier function and suppressing proinflammatory cytokine production (11, 12). Inhalation of therapeutic gases, such as hydrogen sulfide and carbon monoxide, also mitigate renal allograft IRI and improve early transplant kidney function (13, 14). However, the minimal inhibitory effect on rejection and uncertain clinical translational value reduce the value of these treatments and require further investigation (13). Several promising agents that target IRI, such as TAK-242 (a TLR4 inhibitor) and NO, have been examined in preclinical and phase II clinical trials, but their potential side effects, including immune suppression and elevation of methemoglobin, require comprehensive evaluation to maintain the balance between the clinical effect and safety concerns (9). The pathophysiological process of IRI is largely attributed to the unique anatomical and functional features of the kidneys, including the compartment-dividing and glomerular basement membranes, which lack complement regulators, high local concentrations of complement components due to kidney ultrafiltration, local alterations in pH, and disruption or vulnerability of the glycocalyx-lined endothelial wall. These features may be prone to complement activation and induction of various renal disorders (15–18). The complement system is a vital part of innate immunity that is primarily activated by classical, mannose-binding lectin (MBL) and alternative pathways for the clearance of invading pathogens and host cell debris (19). Notably, complement can be also activated at the C5 stage by other serine proteases such as thrombin in a C3-independent manner (20). Complement functions require the formation of a membrane attack complex (MAC, C5b-9) and the release of opsonin molecules (C3b/iC3b/C3d) and anaphylatoxins (C3a and C5a) (21). Several circulating (e.g., FH and C4-BP) and membrane-bound (e.g., CD46, CD55, CD59, and Crry) complement regulatory proteins restrict complement activation at diverse stages to protect host cells from deleterious complement attack (21, 22). Dysregulated complement activation contributes to the pathogenesis of renal IRI, which is characterized by prominent necrotic and apoptotic tubular cells via incompletely identified mechanisms (23–25). Extensive deposition of complement splits of C4d and C3d, particularly in the peritubular capillaries of 73 renal transplant biopsies, indicates activation of the classical pathway in most transplanted kidneys with rejection evidence (26). Consequently, a deficiency of the complement components C3 (27, 28), C5 (27, 29), C6 (27), and FB (30) may protect against renal IRI. Mice deficient in CD55, CD59, Crry, or FH (31–34) are more susceptible to renal IRI. The loss of C3aR and/or C5aR also protect mice from renal IRI (35). Human complement activation, which is characterized by elevated soluble C5b-9 levels, is found in deceased, but not living, donor kidneys (36), which indicates that MAC may be involved in the process of IRI by inducing apoptosis (25, 37). Therefore, diverse complement effectors at multiple activation stages strongly contribute to the pathogenesis of renal IRI, suggesting that complement-targeted therapeutics have strong appeal for renal IRI; however, the underlying mechanisms require further investigation (18). FH is a key inhibitor of the complement alternative pathway and ameliorates IRI by binding to tubular epithelial cells to reduce complement activation (32). We previously conjugated the functional domain of FH with the extracellular domain of CRIg to develop the targeted complement inhibitor CRIg/FH, in which the CRIg portion delivers the fusion protein to the local complement activation site and slightly inhibits complement activation (38, 39). CRIg/FH successfully inhibited the classical and alternative pathways of complement activation and protected rat glomerular mesangial cells from complement-mediated injury and proliferative lesions (38). 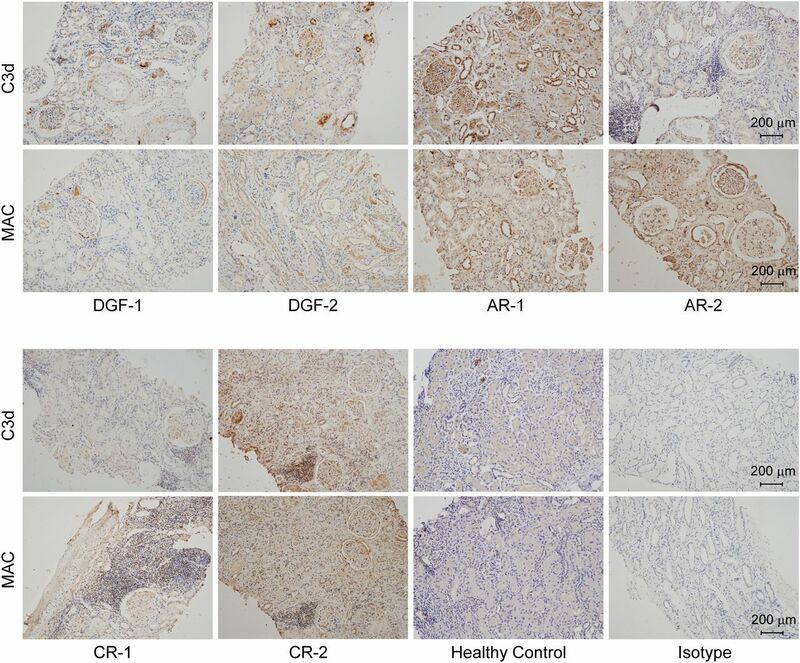 The present study demonstrated the effect of CRIg/FH in the prevention of murine renal IRI and compared the effects of gene deficiencies of seven complement components (FB, C3, C4, C5, C5aR1, C5aR2, and C6, which are components of different complement activation pathways and important anaphylatoxin receptors) on IRI. We also elucidated the underlying molecular mechanisms of CRIg/FH for alleviating renal IRI using a phosphorylation Ab microarray, by which CRIg/FH induced PI3K/AKT activation, thus inhibiting IRI-induced tubular epithelial apoptosis and improving the dysregulated cytokine productions. These findings provide a potential therapeutic strategy for the treatment of IRI in renal transplantation. The medical history of renal transplant recipients was examined from 2016 to 2018 in the Zhongshan Hospital, Fudan University, and 12 patients were enrolled in this study, in which three patients were diagnosed as DGF, seven patients suffered from acute rejection (AR), and two patients suffered from chronic rejection (CR). Fine needle aspiration biopsy specimens were collected from paraffin blocks. Two experienced pathologists assessed pathological rejection according to the guidelines (40). Small renal tissue specimens from three healthy controls were harvested from the donor kidney prior to transplantation for routine time-zero biopsy. The sections were cut to 4 μm for use. Wild-type (WT) C57BL/6 mice were purchased from Shanghai Laboratory Animal Center (Shanghai, China). Complement component gene-deficient mice, including FB, C3, C4, C5 (41), C5aR1, C5aR2, and C6, were sustained by backcrossing with the C57BL/6 genetic background for at least nine generations. C6 knockout mice were kindly gifted by Dr. T. Merkel (Center for Biologics Evaluation and Research, Food and Drug Administration, Bethesda, MD). C5aR2 knockout mice were purchased from Taconic Biosciences (Hudson, NY), and the remaining mouse lines were purchased from The Jackson Laboratory (Bar Harbor, ME). All animals (n = 5–8 in each group) were maintained in a pathogen-free environment on a 12-h light/12-h dark cycle with a standard diet, and age-matched (8- to 10-wk-old) male mice were selected for experiments. Mice were anesthetized with 1% pentobarbital sodium (10 ml/kg) and placed on a warm heating pad in the supine position. The skin was disinfected, and a midabdominal incision was made to expose the two sides of the renal pedicle. The bilateral renal arteries were carefully separated from the ureters and temporarily occluded for 30 min using a mini clamp. Ischemia was affirmed by the kidneys turning dark, and reperfusion was accepted when the dark kidneys returned to a red color. Only an abdominal incision was made in the Sham group and sutured without surgery after 30 min anesthesia (temporarily closed as IRI model). Sera and kidneys were harvested after 48 h and stored according to the experimental needs. The complement inhibitor CRIg/FH was prepared as described previously (38). Briefly, the expression plasmid was transfected into 293FT cells, and CRIg/FH was purified with a Ni2+ Affinity Purification Kit (Novagen, San Diego, CA). CRIg/FH was administered via an i.p. injection (10 mg/kg) 30 min prior to IRI induction (38). Duvelisib (IPI-145; Selleck Chemicals, Houston, TX) was dissolved in PE6400 with Tween-80 and mixed with double-distilled water prior to oral administration (10 mg/kg), immediately followed by CRIg/FH treatment. Briefly, a portion of harvested mouse kidneys was fixed overnight in 10% formalin, embedded in paraffin, and cut into 4-μm sections. Sections were stained with H&E as previously described (42). Sections for C3d, MAC, and phosphor-AKT (Ser473) staining were incubated with 3% hydrogen peroxide to block endogenous peroxidase for 15 min at 37°C, and Ags were retrieved using a high-pressure method in citrate buffer. For human specimens, sections were incubated with an anti-C3d mAb (1:20; ab17453, Abcam, Cambridge, MA) or an anti–C5b-9 polyclonal Ab (1:20; ab55811, Abcam) at 4°C overnight. Sections with mice kidneys were incubated with a mouse complement component C3d affinity purified polyclonal Ab (1:100; AF2655, R&D Systems, Minneapolis, MN), a mouse complement anti–C5b-9 Ab (1:200; ab55811, Abcam), or a phospho-AKT(Ser473)(D9E) XP Rabbit mAb (1:200; no. 4060, Cell Signaling Technology, Danfoss, MA) at 4°C overnight. The sections with mouse C3d or C5b-9 Abs were rinsed three times in PBS and incubated with a HRP-conjugated rabbit anti-goat IgG H&L (1:200; Abcam) and peroxidase-conjugated goat anti-rabbit IgG H&L (1:200; Proteintech Group, Chicago, IL) at room temperature for 1 h. And the sections with human specimens or mouse phosphor-AKT Ab were washed three times with PBS and incubated with GT Vision III Assay for mouse/rabbit (GK347011; Gene Tech, Shanghai, China) at room temperature for 10 min. Immunoreactivity was detected as previously described (42). The isotype IgG controls were performed using the same procedure as primary Ab, in which rabbit isotype IgG I5006 was purchased from Sigma-Aldrich (St. Louis, MO), and goat isotype IgG sc-2028 was purchased from Santa Cruz Biotechnology (Dallas, TX). TUNEL staining for cell apoptosis detection was performed according to the manufacturer’s instructions (MilliporeSigma, Billerica, MA). Slides for semiquantitative analysis were digitized using a Zeiss Axioplan 2 microscope (Zeiss, Oberkochen, Germany) connected to an Axiocam digital camera and KS400 image analysis (Version 3.0) software. Image quantification was performed using KS400 image analysis software, which recognized the image and obtained a ratio using a red/green/blue light color model program. Every mouse kidney sample was stained in one slide, and ten viewing fields of the cortex in each slide at 200× magnification were randomly captured for next calculation. The positive percentage of one viewing field was achieved by calculating the positive area in total area. Jablonski Grade scoring was performed as described previously (43). Two experienced pathologists independently evaluated all pathologic conditions. All the people who conducted the analysis were blind to the information about groups and treatments. The serum levels of blood urea nitrogen (BUN), creatinine (both from BioAssay Systems, Hayward, CA), C3a (LifeSpan BioSciences, Seattle, WA), and C5a (R&D Systems) were measured according to manufacturers’ instructions. Harvested kidneys were homogenized, and the supernatants were collected to measure the local concentrations of cytokines/chemokines. The protein concentrations were normalized using the BCA assay. The profiling of cytokines/chemokines in kidney tissue homogenates (KTHs) was performed in a BD FACSCanto II machine (BD Biosciences, San Jose, CA) using fluorescence-encoded beads (LEGENDplex, BioLegend, San Diego, CA) in which the Mouse Th Cytokine Panel (category no. 740005, 13-plex for IL-2, IL-4, IL-5, IL-6, IL-9, IL-10, IL-13, IL-17A, IL-17F, IL-21, IL-22, IFN-γ, and TNF-α), Mouse Cytokine Panel 2 (category no. 740134, 13-plex for IL-1α, IL-1β, IL-3, IL-7, IL-11, IL-12p40, IL-12p70, IL-23, IL-27, IL-33, IFN-β, GM-CSF, and TSLP), and Mouse Proinflammatory Chemokine Panel (category no. 740007, 13-plex for MCP-1/CCL2, RANTES/CCL5, IP-10/CXCL10, Eotaxin/CCL11, TARC/CCL17, MIP-1α/CCL3, MIP-1β/CCL4, MIG/CXCL9, MIP-3α/CCL20, LIX/CXCL5, KC/CXCL1, BLC/CXCL13, and MDC/CCL22) were selected. A phosphorylation Ab array was performed according to the manufacturer’s instruction (Full Moon BioSystems, Sunnyvale, CA) to profile the levels of phosphorylated proteins in the kidney. Briefly, the supernatants of KTHs from related mice were collected and quantified. Microarray slides were blocked, and the proteins were labeled using biotin and coupled to slides. Slides were washed, and Cy3-streptavidin was added to bind biotin. Fluorescence intensity was measured in a GenePix 4000B machine (Axon Instruments, Scottsdale, AZ). The clustering of target proteins and signaling pathways was assessed using Kyoto Encyclopedia of Genes and Genomes (KEGG) analysis (44), and functional annotation for potential effective molecules and stratified elucidation were performed using Ingenuity Pathway Analysis (IPA) (45). Collection and use of human specimens were performed in accordance with the Declaration of Helsinki, and all patients signed consent forms. The Animal Care and Use Committee of Shanghai Medical College, Fudan University, approved the rodent animal study. The guidelines for the Care and Use of Laboratory Animals published by the National Institutes of Health was followed. All data are represented as the mean ± SD. Statistical analysis between two groups was performed using Student t test, and one-way ANOVA was used to compare the significance among three or more groups. Bonferroni method was used to evaluate the significance conservatively. The calculations and data processing were performed using SAS 8.0 (Cary, NC). To detect the status of complement activation in human renal allografts, we collected biopsy specimens diagnosed as DGF (46), AR, or CR (40), together with healthy controls without renal disease. Table I shows the demographic characteristics and immunosuppressant regiments of these recipients. C3d is the cleavage product of the central complement component C3, and MAC is the terminal product of complement activation. Both of these factors represent the status of local complement activation. We found that the renal tissues of all recipients except for AR-7 exhibited variable but extensive staining for C3d and MAC on glomeruli and tubules (Fig. 1, Supplemental Fig. 1) when compared with the healthy controls. Renal specimen from patient AR-7, who was diagnosed with severe AR and consequently experienced nephrectomy 9 d after receiving the allograft, exhibited smeared staining of C3d and MAC and only necrotic cells without nuclear staining (Supplemental Fig. 1). These findings confirmed that complement was extensively activated in recipients regardless of the posttransplant consequences, such as DGF and allograft rejection. Therefore, complement inhibition may ameliorate IRI and further prevent allograft rejection. Local extensive complement activation as determined by C3d and MAC staining in human transplanted kidneys and healthy control biopsy specimens. We next investigated complement activation in WT mice using C3d and MAC staining and compared these factors to those in mice that were individually deficient in the complement genes FB, C3, C4, C5, C5aR1 (encoding C5aR1), C5aR2 (encoding C5L2), and C6. Briefly, FB is a key component in the alternative pathway, and C3 is a converging molecule for all three pathways. C4 initiates the classical and MBL pathways, and C5 and C6 are critical components of terminal complement activation stages. C5aR1 and C5aR2 are the activating and possible inhibitory receptors for C5a, respectively (21, 22). These molecules cover the different stages and important receptors of the three complement activation pathways and may help elucidate the role of complement activation in renal IRI. C3d (Fig. 2A, 2B) and MAC (Fig. 2E, 2F) exhibited extensive staining in the tubules and glomeruli of mouse kidneys with IRI compared with Sham-operated mice. However, the kidneys of all of the individual gene, but not C5aR2 knockout, mice exhibited significantly reduced levels of C3d (Fig. 2A, 2B) and MAC (Fig. 2E, 2F) deposition. In addition, as we expected, the kidney of C3-deficient mice displayed a negligible C3d staining (Fig. 2A, 2B), whereas the kidneys of C3-, C5-, and especially C6-deficient mice also showed a much weaker MAC staining compared with WT mice (Fig. 2E, 2F). CRIg/FH treatment dramatically reduced C3d (Fig. 2C, 2D) and MAC (Fig. 2G, 2H) deposition, indicating its complement inhibition efficacy. IRI-induced local and systemic complement activation was suppressed by an individual complement gene deficiency and CRIg/FH treatment. (A–H) IRI induced extensive local complement activation in WT mice compared with Sham-operated mice, as determined by C3d (A) and MAC (E) deposition, which were remarkably suppressed by the gene deficiency of FB, C3, C4, C5, C5aR1, and C6 but not C5aR2, and CRIg/FH treatment compared with PBS control (C and G). The related quantitative results are shown in (B), (D), (F), and (H). (I–L) IRI induced extensive systemic complement activation in WT mice compared with Sham-operated mice, as determined by the serum concentrations of C3a (I) and C5a (K), which significantly declined in gene-deficient FB, C3, C4, C5, and C5aR1, but not C5aR2 or C6, mice, and CRIg/FH treatment compared with the PBS control (J and L). FB deficiency suppressed the production of C3a (I) and C5a (K) more strongly than C4 deficiency, which indicates that the alternative pathway was more relatively involved in IRI-induced complement activation than classic and MBL pathways. The related quantitative results are shown in (J) and (L). Bars represent mean ± SD (n = 5–8). ANOVA compared complement component-deficient mice, and the t test was used to compare the CRIg/FH and PBS-treated groups. *p < 0.05. We also measured the serum concentration of C3a and C5a, which represent systemic complement activation. WT mice with IRI exhibited significant increases in C3a and C5a levels compared with those in Sham-operated WT mice (Fig. 2I, 2K), suggesting that IRI systemically activated complement. Deficiencies of FB, C3, C4, C5, and C5aR1, but not C5aR2 or C6, significantly reduced the serum levels of C3a (Fig. 2I) and C5a (Fig. 2K) compared with those in WT mice with IRI. Notably, the C3a and C5a levels in FB-deficient mice were significantly lower than those in C4-deficient mice (Fig. 2I, 2K), suggesting that the alternative pathway plays a more important role than the classical and MBL pathways in IRI, which is consistent with a previous report (27). Furthermore, CRIg/FH significantly impaired the productions of serum C3a (Fig. 2J) and C5a (Fig. 2L) because of the effectively complement inhibition. No C3a (Fig. 2I) or C5a (Fig. 2K) was detected in the serum of C3- and C5-deficient mice, respectively, supporting the reliability of the measurement methods. Notably, we found the reduced deposition of C3d (Fig. 2B) and MAC (Fig. 2F) in C5aR1-deficient mice and the reduced C3a level in C5- and C5aR1-deficient mice (Fig. 2I), suggesting the reduced tissue damage in these mice fed back to retard complement activation within the tissue. In addition, the remaining C5a level in C3-deficient mice, comparable to that in Sham-operated WT mice (Fig. 2K), probably resulted from the complement activation in a C3-independent manner (20). The above evidence suggests that complement is extensively activated locally and systemically in mice with renal IRI, and diverse complement effectors contribute to the pathogenesis of IRI. However, such complement activation could be effectively inhibited by CRIg/FH. These results also revealed a positive feedback regulation between complement activation and renal IRI. We used H&E staining and the Jablonski (43) Grade to quantitatively evaluate renal pathological damage. H&E staining revealed that renal IR induced greater inflammatory cell infiltration in the glomeruli and tubulointerstitium (green arrows), tubular epithelial cells swell and vacuolation (red arrows), cast formation in the tubules (black arrows), and glomerulus atrophy (red arrowheads) in the kidneys compared with those in Sham-operated WT mice (Fig. 3A). However, mice with individual deficiencies in FB, C3, C4, C5, C5aR1, and C6, but not C5aR2, exhibited much weaker renal damage according to H&E staining (Fig. 3A) and much lower Jablonski Grade scores than those of WT mice (Fig. 3B). These results indicate that extensive complement activation participated in IRI-induced renal pathological damage. CRIg/FH treatment efficiently ameliorated renal pathological damage, as demonstrated by H&E staining and the Jablonski Grade scores (Fig. 3C, 3D). 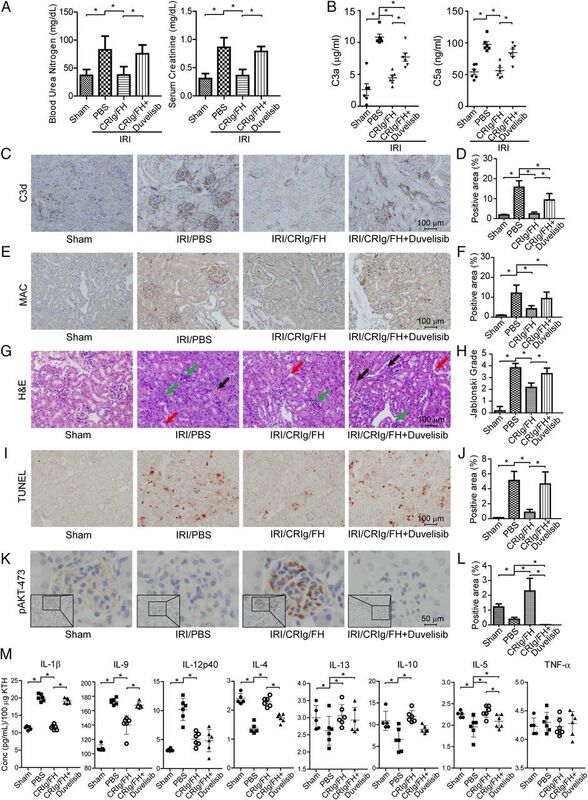 Individual complement gene deficiency and CRIg/FH treatment restored IRI-induced renal histological damage and function impairment. (A–H) IRI resulted in significant renal histological damage in WT mice compared with the Sham-operated mice, as determined by H&E staining (A) and TUNEL assay for apoptosis (E), which were robustly attenuated in gene-deficient FB, C3, C4, C5, C5aR1 and C6, but not C5aR2, mice and by CRIg/FH treatment compared with the PBS control (C and G). The related quantitative results are shown in (B and D) (Jablonski Grade for H&E staining) and (F and H) (TUNEL assay). The green arrows indicate inflammatory cell infiltration in the glomeruli and tubulointerstitium; the red arrows indicate tubular epithelial cells swell and vacuolation; the black arrows indicate cast formation in the tubules; and the red arrowheads indicate glomerular atrophy in (A) and (C). (I–L) IRI produced severe renal function impairment in WT mice compared with Sham-operated mice, as determined by the measurement of BUN (I) and creatinine (J), which were improved in gene-deficient FB, C3, C4, C5, C5aR1, and C6, but not C5aR2, mice, and by CRIg/FH treatment compared with the PBS control (K and L). The green arrows indicate inflammatory infiltration; the red arrows indicate tubular injury; the black arrows indicate cast formation; and the red arrowheads indicate glomerular atrophy (A and C). The bars represent the mean ± SD (n = 5–8). ANOVA was performed among complement component deficiency mice, and the t test was used between the CRIg/FH and PBS-treated groups. *p < 0.05. The process of apoptosis may proceed to tubular cell death (25, 47), and treatment with a mAb against FB prevented apoptosis and renal IRI in mice (48). Therefore, we examined the anti-apoptotic effect of CRIg/FH in WT mice and complement component gene-deficient mice using TUNEL assays. 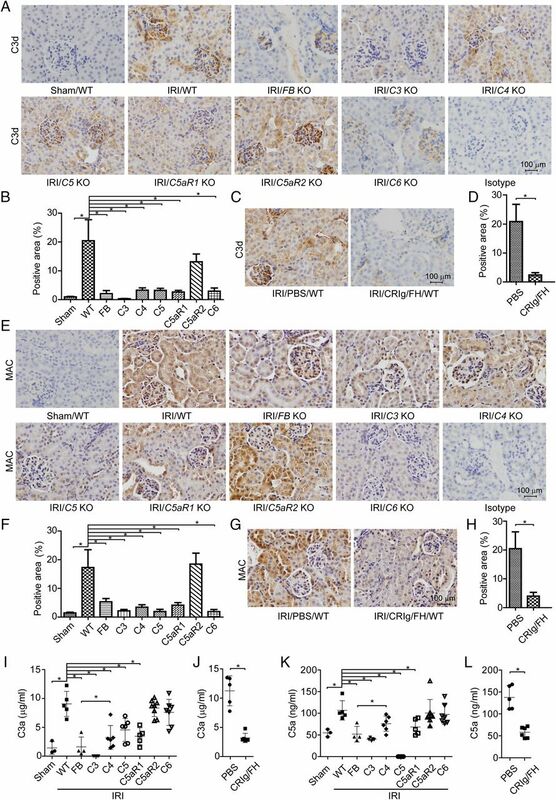 WT mice with renal IRI exhibited significantly more apoptotic damage of tubular endothelial cells compared with Sham-operated WT mice, and the individual deficiency of all genes, except C5aR2, remarkably suppressed renal IRI-induced apoptotic damage (Fig. 3E, 3F). CRIg/FH treatment also reduces the apoptotic damage (Fig. 3G, 3H). We measured the serum levels of BUN and creatinine to functionally identify the renoprotective effect of CRIg/FH in mice with IRI. Renal IRI significantly increased the levels of BUN (Fig. 3I) and creatinine (Fig. 3J) in WT mice compared with those in Sham-operated mice, and individual deficiency of all of the genes, except C5aR2, strongly reversed these effects (Fig. 3I, 3J). CRIg/FH treatment efficiently suppressed the elevated BUN and creatinine levels to a comparable level with gene deficiency (Fig. 3K, 3L). 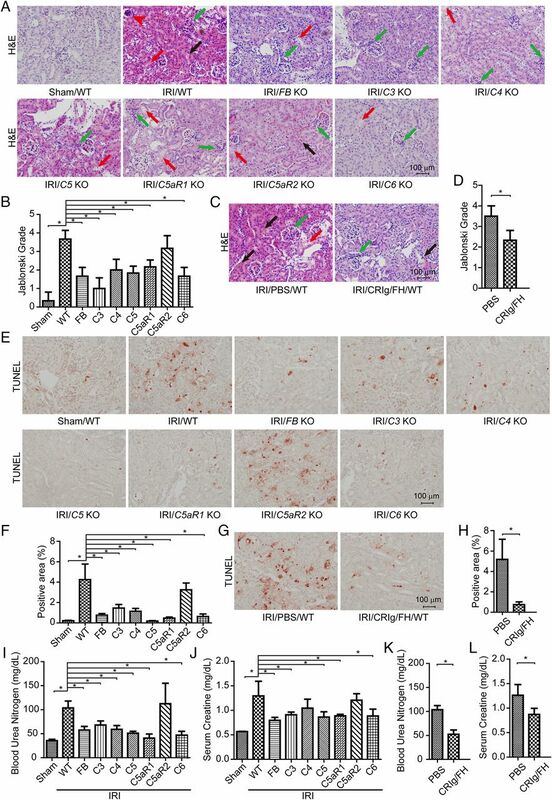 These findings demonstrate that multiple complement effectors contribute to renal IRI, and CRIg/FH treatment exhibits similar effects as gene deficiency on ameliorating IRI-induced renal pathological damage and apoptosis, thus robustly protecting renal function. Further, they also demonstrate the reciprocal interaction between complement activation and renal IRI. Numerous cytokines are involved in the process of renal IRI, including IL-1β (49), IL-4 (50), IL-12 (51), and TNF-α (52) Thus, we profiled the levels of 39 cytokines in KTHs, using the bead-based immunoassay LEGENDplex, to explore the local inflammatory status. Specifically, IL-1β, a traditional proinflammatory cytokine, was significantly elevated in IRI mice compared with Sham-operated WT mice but decreased in FB-, C4-, and C5aR2-deficient mice compared with WT mice with IRI. However, C5aR1 deficiency increased the IL-1β levels (Fig. 4A, left panel). IL-9 is a pleiotropic cytokine that is substantially released in the blood from deceased, but not living, donor kidneys upon reperfusion during human renal transplantation (53). We also found that the local IL-9 levels were significantly elevated in WT mice with IRI but not Sham-operated WT mice. Deficiency of C6 reduced this elevation (Fig. 4B, left panel). IL-12p40 is a shared component of IL-12 and IL-23 and is a chemoattractant for macrophages. IL-12p40 is involved in several pathogenic inflammatory responses, including graft rejection (51). IRI remarkably elevated the local IL-12p40 levels in WT mice compared with Sham-operated mice, and C3 deficiency significantly reduced this elevation (Fig. 4C, left panel). IL-4 and IL-13 promote recovery from AKI by effectively polarizing macrophages/dendritic cells to an M2a phenotype (50). IRI reduced IL-4 and IL-13 levels in WT mice compared with Sham-operated mice. Deficiencies of FB, C3, and C5aR1 elevated IL-4, and deficiency of C6 elevated IL-13 (Fig. 4D, 4E, left panel). Similar results were observed for the anti-inflammatory cytokine IL-10. IRI reduced the local IL-10 levels in WT mice, and deficiency of C3 and C5 significantly reversed this effect (Fig. 4F, left panel). IL-5 is an important Th2 cytokine that stimulates B cell growth and activates eosinophils. IRI decreased local IL-5 levels in WT mice, but this change was NS compared with Sham-operated mice. Deficiency of C5, C5aR1, C5aR2, and C6 significantly elevated IL-5 levels (Fig. 4G, left panel). Notably, IL-25, which exhibits a similar function as IL-5, significantly improved renal function and reduced renal injury by increasing the local and systemic levels of IL-4, IL-5, and IL-13 and promoting the induction of innate lymphoid cells and M2 macrophages in the kidney (54). The TNF-α levels were not significantly different between IRI and Sham-operated WT mice, and individual gene deficiency failed to alter the TNF-α levels, except C6 deficiency, which increased the TNF-α levels (Fig. 4H, left panel). These results suggest that local IL-1β, IL-9, and IL-12p40 cytokines exacerbate renal IRI and that IL-4, IL-13, IL-10, and IL-5 ameliorate renal IRI. Notably, we found that CRIg/FH significantly reduced the IL-1β, IL-4, and IL-12p40 levels compared with PBS treatment (Fig. 4A–C, right panel) and elevated the IL-4, IL-10, IL-5, and TNF-α levels (Fig. 4D–H, right panel). Therefore, complement activation is involved in the process of renal IRI via regulation of the production of multiple cytokines, and these findings provide a novel role for the complement inhibitor CRIg/FH in relieving IRI-related inflammation. The profiles of multiple cytokines. (A–C) IRI increased the local levels of IL-1β (A), IL-9 (B), and IL-12p40 (C) compared with Sham-operated mice, and these levels significantly declined in the indicated gene-deficient mice (left panel) and following CRIg/FH treatment compared with the PBS control (right panel). (D–H) IRI significantly reduced the local levels of IL-4 (D), IL-13 (E), and IL-10 (F) compared with Sham-operated mice and reduced IL-5 (G) and TNF-α (H) without significance; these factors were elevated in the indicated gene-deficient mice (left panel) and following CRIg/FH treatment compared with the PBS control (right panel). The error bars represent the mean ± SD (n = 5–8). ANOVA was performed among complement component deficiency mice, and t test was used between CRIg/FH and PBS-treated groups. *p < 0.05. It is reasonable that not all the 39 profiled cytokines could be significantly regulated by renal IRI and complement activation. Supplemental Fig. 2A–C shows the local levels of 21 cytokines/chemokines, but it is difficult to draw a conclusion about the interplay between complement activation and cytokine production. The remaining 10 cytokines/chemokines were undetectable. A phosphorylation Ab microarray was used to identify the functional proteins and signaling pathways involved in the protective effects of CRIg/FH. Fluorescence analysis revealed that the phosphorylation levels of 25 proteins were upregulated by greater than 1.8-fold and that the levels of 72 proteins were downregulated by more than 0.556-fold with CRIg/FH treatment compared with PBS control (data not shown). We used KEGG signaling pathway analysis of these 97 proteins and found that the most enriched pathway was the PI3K/AKT signaling pathway, which covered 26 proteins/hits (Table II). Nine of these proteins were upregulated phosphorylation sites and 24 were downregulated sites (Fig. 5A), in which one protein may hold multiple phosphorylation sites. Interestingly, although all of these proteins/phosphorylation sites participate in PI3K/AKT signaling, the phosphorylation level of AKT activation at prototypical Ser473 was not so strong (1.86-fold change) compared with other proteins such as PDGFRB at Tyr849 (3.04-fold change). We propose that AKT (Ser473) phosphorylation maybe predominantly occurred in the glomeruli as revealed in the next part, whereas the analyzed samples in the phosphorylation Ab array were whole kidney tissues. The procedure may disguise the real phosphorylation level of AKT in the glomeruli. IPA (QIAGEN) was also used to analyze the above 97 proteins. 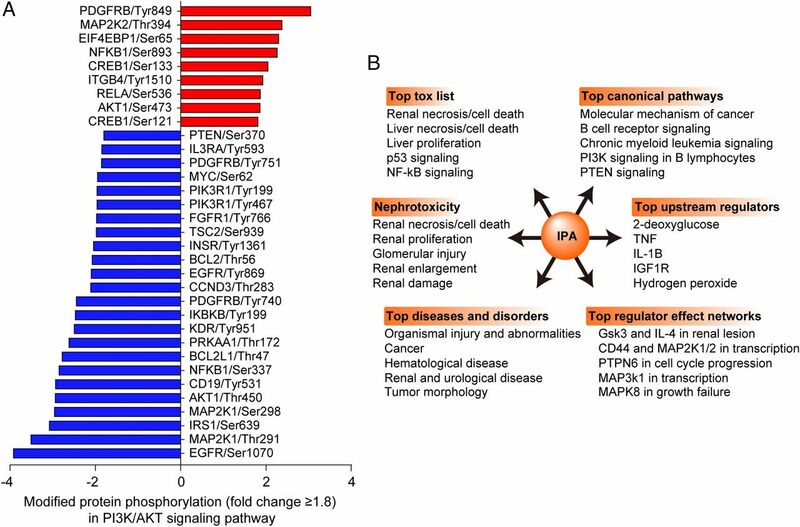 The results revealed that renal necrosis/cell death, glomerular injury, organismal injury, PI3K/PTEN signaling, and IL-1β, Gsk3, and IL-4 in renal lesions were, consistently, the top-ranked proteins (Fig. 5B). The results also demonstrated that HDAC1 phosphorylation was the most upregulated (3.3-fold change) and NF2 was the most downregulated (9.09-fold change) types of phosphorylation. We conclude that PI3K/AKT is the most strongly regulated signaling pathway by CRIg/FH treatment in renal IRI. Identification and analysis of enriched phosphorylated proteins. (A) The phosphorylated proteins that displayed equal to or greater than 1.8-fold change of phosphorylation levels in the phosphorylation Ab array and their phosphorylation sites in the most enriched PI3K/AKT pathway. CRIg/FH versus PBS in the IRI-treated WT mouse kidneys. (B) Analysis of all phosphorylated proteins that exhibited greater than a 1.8-fold change using IPA. The different items showed that renal injury, PI3K signaling, and other related signalings are enriched. Apoptosis is highly associated with the process of IRI, and PI3K/AKT exerts critical functions in antiapoptosis and proliferation. Therefore, we used a specific PI3K inhibitor that targets the p110β/γ/δ subunits, duvelisib, to assess whether the renoprotective function of CRIg/FH in IRI can be abrogated. CRIg/FH treatment combined with duvelisib almost completely abolished the renoprotective effect of CRIg/FH to the degree of PBS control treatment, according to the BUN and serum creatinine levels (Fig. 6A). Notably, the combination of duvelisib with CRIg/FH systemically enhanced complement activation compared with CRIg/FH alone, according to the circulating levels of C3a and C5a (Fig. 6B), and locally, according to renal staining of C3d (Fig. 6C, 6D) and MAC (Fig. 6E, 6F). These unexpected effects of the additive effect of duvelisib on complement reactivation likely resulted from temporary complement inhibition of CRIg/FH and/or the proapoptotic and consequent IRI-exacerbating effect of PI3K blockade that may activate complement cascade via a positive feedback loop. H&E staining consistently showed increased damage in the duvelisib combination treatment compared with CRIg/FH alone treatment, which was determined by greater inflammatory cell infiltration in the glomeruli and tubulointerstitium (green arrows), tubular epithelial cells swell and vacuolation (red arrows), cast formation in the tubules (black arrows) (Fig. 6G), and higher Jablonski Grade scores (Fig. 6H). The TUNEL assay for apoptosis demonstrated similar results (Fig. 6I, 6J), suggesting that PI3K inhibition with the combination of duvelisib administration promoted apoptosis. Notably, phosphorylation of AKT (Ser473), which was increased by 1.86-fold in the CRIg/FH treatment group versus PBS control (Fig. 5A), was primarily detected in the glomerulus region in the CRIg/FH alone treatment group and completely suppressed with of duvelisib administration (Fig. 6K, 6L). IRI with PBS treatment remarkably impaired AKT activation in the glomeruli compared with the Sham operation (Fig. 6K), suggesting a lack of growth factors to activate PI3K/AKT signaling during the process of ischemia. In the Sham-operated mice, compared with PBS control, CRIg/FH treatment failed to affect the renal function determined by the levels of BUN and creatinine (Supplemental Fig. 3A); however, it still induced significantly stronger AKT phosphorylation (Supplemental Fig. 3B, 3C). These results indicate that CRIg/FH shows no renal toxicity and may protect kidney from the Sham operation-induced injury, if any, by activating PI3K/AKT signaling. In addition, the addition of duvelisib failed to significantly change the levels of BUN and creatinine in either Sham operation or IRI condition (Supplemental Fig. 4A). We also observed the similar results by the staining of C3d and MAC, H&E staining, and TUNEL assay (Supplemental Fig. 4B–G). Duvelisib abrogated the renoprotective role of CRIg/FH against renal IRI via suppression of PI3K/AKT activation. (A) Duvelisib almost completely abrogated the protective effect of CRIg/FH on renal function, as determined by the measurement of BUN and creatinine. (B–F) Duvelisib remarkably reversed the complement inhibitory effect of CRIg/FH, as determined by the systemic serum concentrations of C3a and C5a (B), renal local deposition of C3d (C) and its quantitative results in (D), and MAC (E) and its quantitative results in (F). (G–J) Duvelisib strongly abolished the histological protection of CRIg/FH against renal IRI, which was determined using H&E staining (G), Jablonski Grade scoring (H), and TUNEL assay for apoptosis (I and its quantitative results in J). The green arrows indicate inflammatory cell infiltration in the glomeruli and tubulointerstitium; the red arrows indicate tubular epithelial cells swell and vacuolation; and the black arrows indicate cast formation in the tubules in (G). (K and L) Duvelisib completely inhibited the AKT phosphorylation (Ser473) that was strongly activated by CRIg/FH predominantly in the glomerulus regions (K), and the quantitative results are shown in (L). IRI significantly suppressed the indigenous AKT activation that occurred in glomeruli with Sham operation. (M) Duvelisib reduced the regulatory effect of CRIg/FH on multiple cytokines with significance for IL-1β, IL-9, IL-12p40, and IL-4 and without significance for IL-13, IL-10, IL-5, and TNF-α. The bars represent the mean ± SD (n = 5–6). ANOVA was performed among the Sham group and PBS, CRIg/FH, and CRIg/FH/duvelisib groups with IRI. *p < 0.05. Further, we detected the effect of the combination treatment of CRIg/FH with duvelisib on the local levels of certain cytokines (Fig. 4) that were modified by the CRIg/FH alone treatment. Profiling of cytokines/chemokines revealed that the combination duvelisib treatment promoted the production of IL-1β and IL-9 and inhibited the production of IL-4, IL-13, IL-10 and IL-5 compared with CRIg/FH alone treatment (Fig. 6M), but the alterations of IL-13 and IL-10 were not significantly different. In addition, duvelisib had no effect on IL-12p40. No significant difference in the local TNF-α levels was observed between the Sham operation, PBS, CRIg/FH, and CRIg/FH combined with duvelisib treatments in IRI. These findings suggest that the PI3K blockade abrogated the renoprotective effect of CRIg/FH via induction of apoptosis and alterations in the production of multiple cytokines, which further highlights the critical role of PI3K/AKT signaling in ameliorating renal IRI (Fig. 7). The overview of complement cascade activation and targets of inhibitors. As depicted in the complement cascade (blue dotted line frame), the classical and MBL pathway split the C3 into C3a and C3b by C3 convertase C4b2a, whereas the alternative pathway cleave C3 to C3a and C3b by another C3 convertase C3bBb, in which C3b can initiate an alternative pathway via amplification loop. The C5 convertase is formed by C3b binding to C3 convertase (C4b2a or C3bBb) and then catalyze C5 into C5a and C5b, the latter of which further triggers the formation of MAC by sequentially assembling C6, C7, C8, and multi-C9. The indicated complement regulatory proteins, including Crry, FH, CD55, CD46, and CD59, restrict complement activation at different stages. Notably, C5 can also be cleaved by other serine proteases such as thrombin in a C3-independent manner. The C3a and C5a are potent anaphylatoxins by interacting with their receptors C3aR or C5aR/C5L2, respectively. The complement activation contributes to the pathogenesis of renal IRI via the effectors of C3b, anaphylatoxins C3a/C5a, and MAC. Therefore, a deficiency of the complement components C3 (27, 28, 67), C5 (27, 29), C6 (27), or FB (30, 73) alleviates renal IRI; in contrast, a deficiency of CD55, CD59, Crry, or FH (31–34, 74), exacerbates renal IRI. In addition, the loss of C3aR and/or C5aR also protects mice from renal IRI (35, 75). However, the role of C5L2 is still controversial (76, 77). In this study, we further demonstrated that the deficiency of FB, C3, C4, C5, C5aR1, or C6 alleviates murine renal IRI, whereas the deficiency of C5aR2 fails to affect IRI determined by detecting complement activation, renal function, tubular epithelial apoptosis, and cytokine production (green dotted line frame). In addition, a targeted complement inhibitor CRIg/FH potently protects the kidney from IRI, probably via PI3K/AKT activation because a PI3K inhibitor duvelisib almost abrogates the renoprotective role of CRIg/FH. Therefore, this finding reveals the positive feedback between complement activation and renal IRI and further suggests the candidate drugs for IRI prevention/treatment, such as CRIg/FH and PI3K/AKT agonists. Renal transplantation is one choice for treating end-stage renal diseases. The rate of acute renal allograft rejection has been reduced to <10% with advances in immunosuppression, HLA matching, and intensive medical care. However, long-term renal graft survival is only 8–11 y (55). Therefore, a better understanding of the pathogenesis of allograft injury may promote the development of novel therapeutics to prolong renal allograft survival. The current study confirmed that complement was extensively activated in recipients with biopsy-proved renal allograft rejection and mice with renal IRI. The complement inhibitor CRIg/FH primarily inhibited the alternative pathway and powerfully prevented complement local deposition and systemic activation, which dramatically ameliorated histological injury and improved renal function by reducing tubular apoptosis and modifying production of multiple cytokines. Notably, CRIg/FH exhibited a parallel function with an individual deficiency of several genes of complement components to a comparable degree. These findings revealed the reciprocal interaction between complement activation and renal IRI. We further unveiled that the renoprotective effect of CRIg/FH most likely resulted from activation of the PI3K/AKT signaling pathway, and inhibition of this pathway essentially abrogated the protective role of CRIg/FH on mouse renal IRI. Therefore, our findings demonstrate that CRIg/FH exhibits great potential for acute IRI treatment and that the underlying molecular mechanisms should be further elucidated. Twelve patients with DGF or allograft rejection were matched for panel reactive Ab, HLA, and lymphocytotoxicity prior to transplantation, but we still observed extensive complement activation. Similar results were observed in mouse IRI with the systemic increases in C3a and C5a and the local depositions of C3d and MAC in glomeruli and tubules. Seven individual gene (FB, C3, C4, C5, C5aR1, C5aR2, or C6)-deficient mice, covering different stages of complement activation, different complement activation pathways, and two receptors for the important anaphylatoxin C5a, were used to investigate the role of complement in renal IRI. We found that the loss of all of these complement components, except C5AR2, exerted significant renoprotective effects to varying degrees, indicating the diversity and complexity of complement involvement in IRI. The inflammatory role of C5L2 is enigmatic and controversial. We report that the loss of C5L2 did not obviously alter the process of renal IRI. Therefore, the disease-exacerbating function of complement activation requires complement-targeted therapeutics in many human kidney disorders, including allograft rejection (17, 56). The contribution of complement activation to the increasing number of clinical conditions, including many kidney diseases, has led to the investigation of more than 20 candidate drugs targeting various stages and receptors of complement activation in clinical trials, and additional interventions are in preclinical development. However, these complement-targeted interventions require careful and individual evaluation because of the diverse and complex roles of complement activation under pathophysiological conditions with various stages and receptors. Preischemic treatment with a C5aR antagonist protected kidneys from IRI (57, 58). A CD35/CR1-derived fusion protein attenuated IRI in animal models of renal transplantation (59) and is currently being tested in a phase II clinical trial (EMPIRIKAL) for the treatment of DGF, which is often associated with IRI (60). Eculizumab (Soliris, Alexion Pharmaceuticals) is also in phase II clinical trials to determine its efficacy in preventing posttransplant DGF (NCT01403389, NCT01919346). CR2/FH (TT30) is a fusion complement inhibitor that targets only the alternative pathway (61), and it efficiently ameliorates experimental C3 glomerulopathy (62) and attenuates IRI in the liver, brain, intestine, lung, and vascularized composite allografts (63–66). Recently, an engineered mini-FH also showed a protective role for C3 glomerulopathy (67). In this study, we evaluated the effect of CRIg/FH in protecting the kidneys from IRI. CRIg/FH effectively inhibited the complement classical pathway, but the alternative pathway was the primary target. CRIg/FH functionally anchors the complement-targeted host cell membrane for 12 d because of its slow dissociation rate (38). We observed that CRIg/FH robustly abolished the local deposition of C3d and MAC in the kidney with IRI and efficiently reduced the systemic level of C3a and C5a, which functionally protected the kidney from IRI by preventing histological damage, suppressing apoptosis, and modifying the production of multiple cytokines. PI3K/AKT was identified as the critical signaling pathway for CRIg/FH. A phosphorylation Ab array demonstrated that the PI3K/AKT pathway was the most enriched pathway following CRIg/FH treatment, which was further validated in the IPA data. Several studies have demonstrated that PI3K/AKT pathway plays a critical role in renal functional and structural recovery from AKI (68–71), in which YAP activation may be an important downstream modulator for the proximal tubule epithelial cells (71). IRI remarkably suppressed activation of PI3K/AKT signaling in glomeruli, which may result from the lack of sufficient growth factors during the process of ischemia. Therefore, replenishment of growth factors or PI3K/AKT agonists may be required to preserve donor kidneys and prevent IRI. Duvelisib is a specific inhibitor of the p110β/γ/δ subunits of PI3K and almost completely abrogated the renoprotective role of CRIg/FH for IRI when combined with CRIg/FH, as determined by the detection of renal function, complement activation, histological damage, apoptosis, and cytokine profiling. However, the underlying mechanisms for complement inhibition by CRIg/FH via activation of PI3K/AKT signaling in glomeruli require future investigation. We noted that HDAC1, a kind of histone acetyltransferase, was the top-ranked upregulated phosphorylated protein. Phosphorylated HDAC1, which has increased deacetylase activity, suppresses inflammation by inhibiting C/EBP-δ expression, which is an amplifier of inflammation (72), to ameliorate IRI. Therefore, our findings revealed the diversity and complexity of complement activation in the exacerbation of renal IRI and the great potential of CRIg/FH for the treatment of renal IRI (Fig. 7). We support the further development of candidate drugs, such as agonists for PI3K/AKT activation and HDAC1 phosphorylation. We thank Yingyong Hou (Zhongshan Hospital, Fudan University) for help in collecting human allograft specimens and interpreting pathological differences. We thank Qunye Tang (Zhongshan Hospital, Fudan University) for collecting and interpreting the HLA matching and related information. We thank Mangen Song and Wenjun Gao (Zhongshan Hospital, Fudan University) for technical assistance with the establishment of the IRI animal model. This work was supported by grants to W.H. from the Shanghai Municipal Science and Technology Commission (15431900500) and the Program for Professor of Special Appointment (Eastern Scholar, GZ2014002) at the Shanghai Institutions of Higher Learning and grants to T.Z. from the Natural Science Foundation of China (81570674) and the Shanghai Municipal Science and Technology Commission (16431902300).
. 2013. World incidence of AKI: a meta-analysis. Clin. J. Am. Soc. Nephrol. 8: 1482–1493.
. 2013. Acute kidney injury: an increasing global concern. Lancet 382: 170–179.
. 2014. Acute kidney injury-epidemiology, outcomes and economics. Nat. Rev. Nephrol. 10: 193–207.
. 2015. Ischemia-reperfusion injury in kidney transplantation. Front. Biosci. (Elite Ed.) 7: 117–134.
. 2014. The effect of ischemia/reperfusion on the kidney graft. Curr. Opin. Organ Transplant. 19: 395–400. 2014. Ischaemia-reperfusion injury: a major protagonist in kidney transplantation. Nephrol. Dial. Transplant. 29: 1134–1140.
. 2013. Renal ischemia-reperfusion injury amplifies the humoral immune response. J. Am. Soc. Nephrol. 24: 1063–1072.
. 2014. Delayed kidney graft function: from mechanism to translation. Kidney Int. 86: 251–258.
. 2011. Ischemia and reperfusion--from mechanism to translation. Nat. Med. 17: 1391–1401.
. 2001. Cold ischemia time: an independent predictor of increased HLA class I antibody production after rejection of a primary cadaveric renal allograft. Transplantation 71: 875–879.
. 2013. Donor simvastatin treatment prevents ischemia-reperfusion and acute kidney injury by preserving microvascular barrier function. Am. J. Transplant. 13: 2019–2034.
. 2012. Donor preconditioning with rabbit anti-rat thymocyte immunoglobulin ameliorates ischemia reperfusion injury in rat kidney transplantation. Transpl. Immunol. 27: 1–7.
. 2015. Hydrogen sulfide treatment mitigates renal allograft ischemia-reperfusion injury during cold storage and improves early transplant kidney function and survival following allogeneic renal transplantation. J. Urol. 194: 1806–1815.
. 2015. Update on ischemia-reperfusion injury in kidney transplantation: Pathogenesis and treatment. World J. Transplant. 5: 52–67.
. 2012. Role of complement and perspectives for intervention in ischemia-reperfusion damage. Ann. Med. 44: 205–217.
. 2011. Cellular pathophysiology of ischemic acute kidney injury. J. Clin. Invest. 121: 4210–4221.
. 2018. The renaissance of complement therapeutics. Nat. Rev. Nephrol. 14: 26–47.
. 2016. Complement in disease: a defence system turning offensive. Nat. Rev. Nephrol. 12: 383–401.
. 2012. The role of complement in the early immune response to transplantation. Nat. Rev. Immunol. 12: 431–442.
. 2006. Generation of C5a in the absence of C3: a new complement activation pathway. Nat. Med. 12: 682–687.
. 2008. The role of complement in the mechanism of action of rituximab for B-cell lymphoma: implications for therapy. Oncologist 13: 954–966.
. 2014. 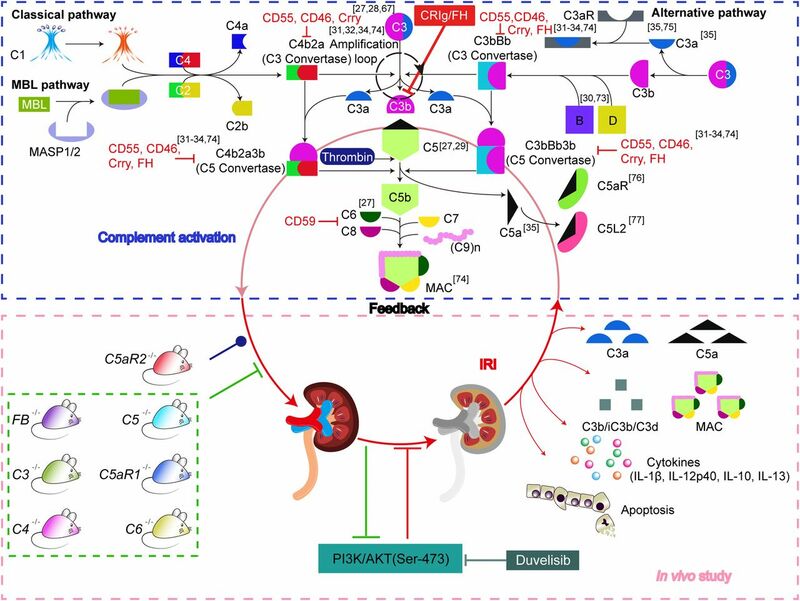 Complement as a multifaceted modulator of kidney transplant injury. J. Clin. Invest. 124: 2348–2354.
. 2013. Complement-binding anti-HLA antibodies and kidney-allograft survival. N. Engl. J. Med. 369: 1215–1226.
. 1999. Inhibition of apoptosis induced by ischemia-reperfusion prevents inflammation. J. Clin. Invest. 104: 541–549.
. 1991. Vascular deposition of complement-split products in kidney allografts with cell-mediated rejection. Clin. Exp. Immunol. 86: 464–470.
. 2000. Predominant role for C5b-9 in renal ischemia/reperfusion injury. J. Clin. Invest. 105: 1363–1371.
. 2001. Inhibiting the complement system does not reduce injury in renal ischemia reperfusion. J. Am. Soc. Nephrol. 12: 1383–1390.
. 2003. Inhibition of complement factor C5 protects against renal ischemia-reperfusion injury: inhibition of late apoptosis and inflammation. Transplantation 75: 375–382.
. 2003. Lack of a functional alternative complement pathway ameliorates ischemic acute renal failure in mice. J. Immunol. 170: 1517–1523.
. 2004. Critical protection from renal ischemia reperfusion injury by CD55 and CD59. J. Immunol. 172: 3869–3875.
. 2006. Altered renal tubular expression of the complement inhibitor Crry permits complement activation after ischemia/reperfusion. J. Clin. Invest. 116: 357–368.
. 2011. Binding of factor H to tubular epithelial cells limits interstitial complement activation in ischemic injury. Kidney Int. 80: 165–173.
. 2010. The complement inhibitors Crry and factor H are critical for preventing autologous complement activation on renal tubular epithelial cells. J. Immunol. 185: 3086–3094.
. 2012. C3a and C5a promote renal ischemia-reperfusion injury. J. Am. Soc. Nephrol. 23: 1474–1485.
. 2013. Acute but transient release of terminal complement complex after reperfusion in clinical kidney transplantation. Transplantation 95: 816–820.
. 2002. The membrane attack complex of complement induces caspase activation and apoptosis. Eur. J. Immunol. 32: 783–792.
. 2014. A novel CRIg-targeted complement inhibitor protects cells from complement damage. FASEB J. 28: 4986–4999.
. 2006. Structure of C3b in complex with CRIg gives insights into regulation of complement activation. Nature 444: 217–220.
. 2003. Antibody-mediated rejection criteria - an addition to the Banff 97 classification of renal allograft rejection. Am. J. Transplant. 3: 708–714.
. 2015. A simple PCR-based method for the rapid genotyping of inherited fifth complement component (C5)-deficient mice. Exp. Anim. 64: 261–268.
. 2016. Complement component 6 deficiency increases susceptibility to dextran sulfate sodium-induced murine colitis. Immunobiology 221: 1293–1303.
. 1983. An experimental model for assessment of renal recovery from warm ischemia. Transplantation 35: 198–204.
. 2000. KEGG: kyoto encyclopedia of genes and genomes. Nucleic Acids Res. 28: 27–30.
. 2009. Association between delayed graft function and allograft and patient survival: a systematic review and meta-analysis. Nephrol. Dial. Transplant. 24: 1039–1047.
. 1998. Induction of apoptosis in ischemia-reperfusion model of mouse kidney: possible involvement of Fas. J. Am. Soc. Nephrol. 9: 620–631.
. 2006. Treatment with an inhibitory monoclonal antibody to mouse factor B protects mice from induction of apoptosis and renal ischemia/reperfusion injury. J. Am. Soc. Nephrol. 17: 707–715.
. 1998. Role of IL-1 in renal ischemic reperfusion injury. J. Am. Soc. Nephrol. 9: 614–619.
. 2017. IL-4/IL-13-mediated polarization of renal macrophages/dendritic cells to an M2a phenotype is essential for recovery from acute kidney injury. Kidney Int. 91: 375–386.
. 2007. IL-12p40: an inherently agonistic cytokine. Trends Immunol. 28: 33–38.
. 2013. Adiponectin prevents islet ischemia-reperfusion injury through the COX2-TNFα-NF-κB-dependent signal transduction pathway in mice. J. Endocrinol. 218: 75–84.
. 2013. Interleukin-9 release from human kidney grafts and its potential protective role in renal ischemia/reperfusion injury. Inflamm. Res. 62: 53–59.
. 2015. Il-25 elicits innate lymphoid cells and multipotent progenitor type 2 cells that reduce renal ischemic/reperfusion injury. J. Am. Soc. Nephrol. 26: 2199–2211.
. 2011. Solid organ allograft survival improvement in the United States: the long-term does not mirror the dramatic short-term success. Am. J. Transplant. 11: 1226–1235.
. 2015. The emerging role of complement inhibitors in transplantation. Kidney Int. 88: 967–973.
. 2014. Tissue-specific deletion of Crry from mouse proximal tubular epithelial cells increases susceptibility to renal ischemia-reperfusion injury. Kidney Int. 86: 726–737.
. 2003. A small molecule C5a receptor antagonist protects kidneys from ischemia/reperfusion injury in rats. Kidney Int. 63: 134–142.
. 2006. Therapeutic strategy with a membrane-localizing complement regulator to increase the number of usable donor organs after prolonged cold storage. J. Am. Soc. Nephrol. 17: 1102–1111.
. 2017. A double-blind randomised controlled investigation into the efficacy of Mirococept (APT070) for preventing ischaemia reperfusion injury in the kidney allograft (EMPIRIKAL): study protocol for a randomised controlled trial. Trials 18: 255.
. 2011. Design and development of TT30, a novel C3d-targeted C3/C5 convertase inhibitor for treatment of human complement alternative pathway-mediated diseases. Blood 118: 4705–4713.
. 2016. Efficacy of targeted complement inhibition in experimental c3 glomerulopathy. J. Am. Soc. Nephrol. 27: 405–416.
. 2009. A complement-dependent balance between hepatic ischemia/reperfusion injury and liver regeneration in mice. J. Clin. Invest. 119: 2304–2316.
. 2012. The alternative complement pathway propagates inflammation and injury in murine ischemic stroke. J. Immunol. 189: 4640–4647.
. 2008. A novel targeted inhibitor of the alternative pathway of complement and its therapeutic application in ischemia/reperfusion injury. J. Immunol. 181: 8068–8076.
. 2017. Targeted complement inhibition protects vascularized composite allografts from acute graft injury and prolongs graft survival when combined with subtherapeutic cyclosporine a therapy. Transplantation 101: e75–e85.
. 2018. An engineered complement factor h construct for treatment of c3 glomerulopathy. J. Am. Soc. Nephrol. 29: 1649–1661.
. 1997. Production of heparin binding epidermal growth factor-like growth factor in the early phase of regeneration after acute renal injury. Isolation and localization of bioactive molecules. J. Clin. Invest. 99: 2128–2138.
. 2003. Importance of functional EGF receptors in recovery from acute nephrotoxic injury. J. Am. Soc. Nephrol. 14: 3147–3154.
. 2014. Renal cortical hexokinase and pentose phosphate pathway activation through the EGFR/Akt signaling pathway in endotoxin-induced acute kidney injury. Am. J. Physiol. Renal Physiol. 307: F435–F444.
. 2018. Egf receptor-dependent yap activation is important for renal recovery from aki. J. Am. Soc. Nephrol. 29: 2372–2385.
. 2013. Suppression of inflammation and acute lung injury by Miz1 via repression of C/EBP-δ. Nat. Immunol. 14: 461–469.
. 2017. Complement alternative pathway deficiency in recipients protects kidney allograft from ischemia/reperfusion injury and alloreactive t cell response. Am. J. Transplant. 17: 2312–2325.
. 2017. Overexpression of human cd55 and cd59 or treatment with human cd55 protects against renal ischemia-reperfusion injury in mice. J. Immunol. 198: 4837–4845.
. 2008. Gene silencing of complement C5a receptor using siRNA for preventing ischemia/reperfusion injury. Am. J. Pathol. 173: 973–980.
. 2010. Deficiency of C5aR prolongs renal allograft survival. J. Am. Soc. Nephrol. 21: 1344–1353.
. 2018. Structure and characterization of a high affinity C5a monoclonal antibody that blocks binding to C5aR1 and C5aR2 receptors. MAbs 10: 104–117.